Had some new brakes put on this week just in time for a 1 day of instructing at CoTA. My student didn't have a right seat -- so we did lead follow. Including running my own sessions -- I did 9 x 25 minute sessions yesterday in 90+ degree heat. Lap times at the end of the day were as good as they were in the beginning of the day and not a whimper out of the poor girl. Man, I find it so cool that there are tracks whers people are running 986's foŕ PCA DE days! Up here at Tremblant, people have too much money! All GT3's and stuff! Makes me feel like the poor cousin! And 9 sessions in one day? Damn, that's a lot of track time! Well at CoTA, there is no lack of money -- but someone has to represent the 99%ers. The smile factor per $ of my Boxster is just phenomenal. just being able to check air pressures, torque lug nuts, top off oil, clean the windshield and drive to and on the track and back. man, been wanting to rant about this for a while. you go to the rennlist canada regional forum (really, it should be rennlist toronto) and it's all db's sharing photos of their gt3rs' (guys who own two of them and have professional photogs take photos of them side by side) pages of discussion about the gt3 wait list (but don't worry they say, because they've got another $250k car to drive in the meantime) etc. i mean, it's bad out west too - lots of arrivers (vs drivers) in their gt3's, but lots of hotshoes too, looking for the fastest thing. 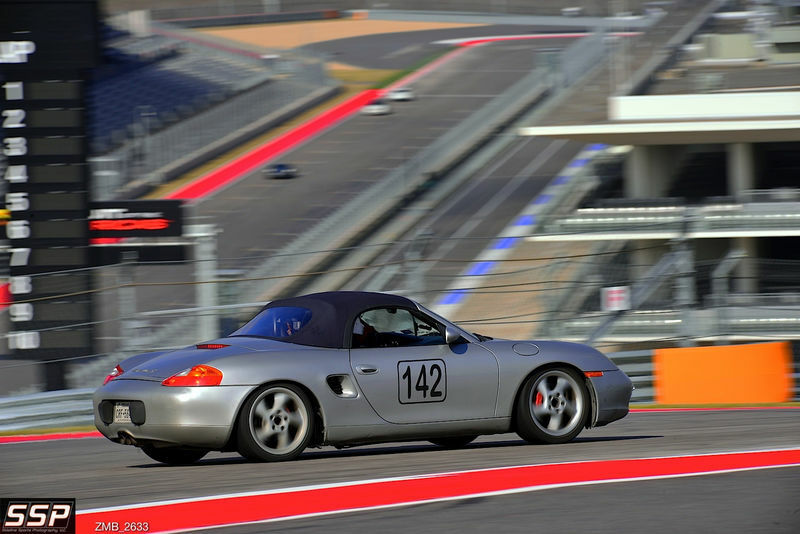 at the track there are always several gt3 and gt4's, as well as big $ italian and american rides, but for every $100k+ car there is a boxster, miata, s2000 and a a$$ton of brzs. the best part is showing up in the oldest, cheapest, least hp car, and running with (often passing - last session i reeled in an aventador and a gt4) the big dogs. i love my little s too. I love my Boxster S and it's probably perfect for me just starting in HPDE - 2 last year and my first of 3 for this year just over a week ago. At the HPDE's I've attended, there have been lots of GT3's, a GT3 RS, some GT3 Cup cars and plenty of exotic stuff. But also lots of Boxsters, Caymans, 944s and older air cooled 911's. My instructor at my last event had a 991 GT3. Nice guy and a good teacher for me. He took me out in his GT3 during one session and he could and did really drive it! Last edited by jaykay; 06-16-2017 at 02:12 PM. Mike, what a sweet looking ride. I'd like to lower mine and have it look just like yours.